We are a leading Manufacturer of gautam buddha sitting pose black and gautam buddha sitting pose white from Bhilai, India. This majestic blessing posture of The Lord Buddha is a timeless posture. 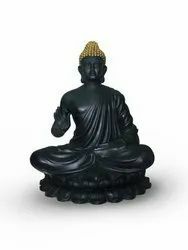 The Buddha Figurine in black and golden combination seating on a Lotus Base is a beautifully crafted showpiece decor. Minute attention has been taken to ensure every inch of this timeless piece is flawless. Perfect for adorning any suite, mansion, office etc. Its present will Spread vibrant positive energy in the surrounding. Approx dimensions: H- 45 inch, W- 29 inch, D- 20 inch, Weight- 15.5 kg. This majestic blessing posture of The Lord Buddha is a timeless posture. 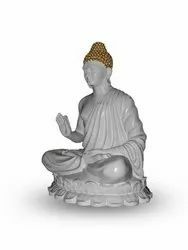 The Buddha Figurine in white and golden combination seating on a Lotus Base is a beautifully crafted showpiece decor. Minute attention has been taken to ensure every inch of this timeless piece is flawless. Perfect for adorning any mansion, office, temple etc. Its present will Spread vibrant positive energy in the surrounding. Approx dimensions: H- 45 inch, W- 29 inch, D- 20 inch, Weight- 15.5 kg.